See Time For a Change for the first in this series, or view the index to see all the posts dealing with Arch Linux. After taking some time off from setting up my new model Arch home (primarily for repairing my real home), I'm continuing with application installation. Before I started, I took a VirtualBox snapshot in case I had to roll back. I called "After Easys", for obvious reasons. Today, I tackled ThinkOrSwim, which I use for options trading. This isn't in any repositories, so I had to log into my account at TD Ameritrade (ThinkOrSwim's new owner), and go to their download page. It automatically detected I was on Linux, and gave me a handy link to click to download "thinkorswim_installer.sh". Then it was a simple matter of giving that script execute permission and running it, and I was off to the races. But there were a couple of little wrinkles. The default install location is /usr/local/thinkorswim, but a normal user doesn't have write access to that directory. So it's important to change it to be somewhere the user has access to - in this case, I chose /home/mark/thinkorswim. You might think that simply installing it with "sudo" is the right answer, but no. Do that, and it refuses to run for a non-root user. The Java-based installer also fails to create any icons (known as launchers in Linux) in KDE, so it needs some manual assistance. 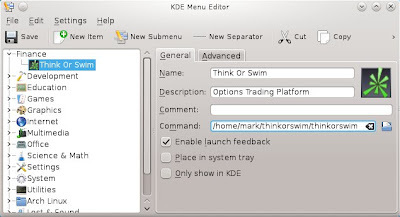 I remember when I installed ThinkOrSwim on my Gnome-based Ubuntu desktop, it managed to create a launcher on the desktop, so it must be that KDE confuses it somehow. First, I looked around in the /home/mark/thinkorswim directory to see if anything looked helpful. What I was looking for was, at the least, a guess at what the command is to launch it, or at most, a pre-made launcher that just needs to be put somewhere useful. After hitting "Save", my new group and icon for Think Or Swim showed up just as I wanted them to.